In my last 3D printing post, I tackled the setup and first print on my new MonoPrice select mini V2 3D printer. The print turned out great and I was excited to keep printing but that meant I needed some new filament to use for the machine. As usual – I turned to Amazon to see what I could find for 1.75mm filament. I ended up finding a reel of filament from a company called 3D Solutech. It seemed reasonably priced and got lots of great reviews so I decided to give it a try. 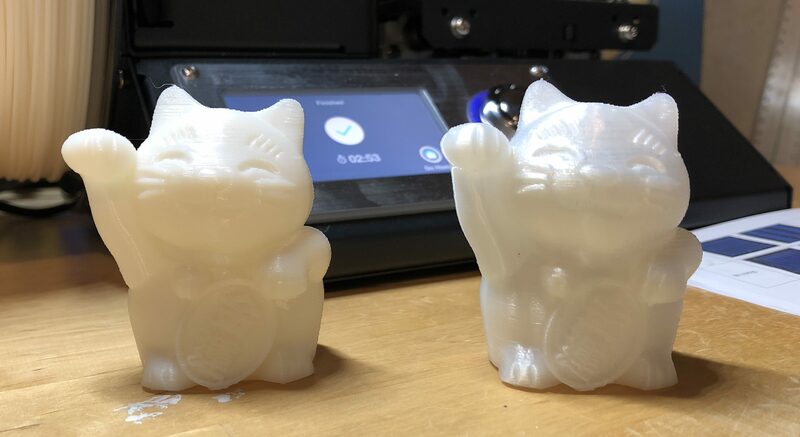 In this video, I load the new filament into the machine and run the cat test print again to make sure I got similar results. My fear was that I’d move to a new project, try printing, get bad results, and then not be sure if it was the filament or something else causing me issues. Doing another cat print would give me a new baseline to ensure that the new filament was working just as well as the old filament. Note: I forgot to mention this in the video – but I used the same extruder (200 degrees C) and bed (60 degrees C)temperatures that I had used with the include filament.